Proposed by China’s President Xi Jinping in 2013, the Belt and Road Initiative (BRI) is the world’s largest project of connectivity in modern times. Along the Silk Road Economic Belt and the 21st Century Maritime Silk Road, cooperation is focused on policy, infrastructure, trade, financial and people. 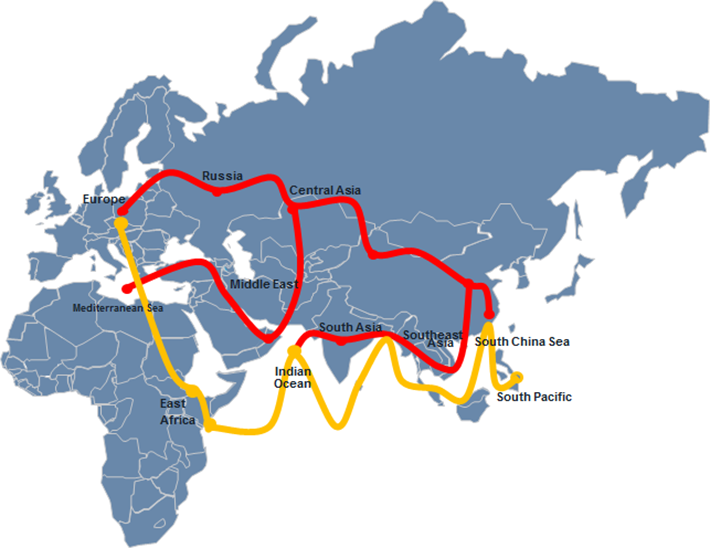 The “Belt” links China with South East Asia, South Asia, Central Asia, Russia and Europe by land, and the “Road” is a sea route connecting China with South East and South Asia, East Africa and the Middle East. The initiative touches 65 countries, 69% of world’s population and 29% of world’s economy(1). China’s outbound investment is expected to reach $600-$800 billion over the next five years(2). There is huge opportunity for global investment to enhance the connectivity of the Belt and Road. London, the most international financial centre in the world, is on hand to facilitate this initiative. "China has reached a new starting point in its development endeavors. Guided by the vision of innovative, coordinated, green, open and inclusive development, we will adapt to and steer the new normal of economic development and seize opportunities it presents. We will actively promote supply-side structural reform to achieve sustainable development, inject strong impetus into the Belt and Road Initiative and create new opportunities for global development". "As China drives forward the Belt and Road initiative from the East, we in Britain are a natural partner in the West, standing ready to work with all partner countries to make a success of this initiative, and delivering the jobs, growth and higher living standards that must be our central ambition for all of our citizens." London Stock Exchange Group (LSEG), the global centre of capital raising and leader in green finance, connects market participants along the Belt and Road. "London Stock Exchange has played a major role in helping companies on Belt and Road to access international capital traditionally, and we are committed to continue to support growth of this region." "The success of the bond issued by Bank of China Hungarian Branch shows that international investors have great confidence in the CEE region and also in the ‘One Belt, One Road’ projects initiated by China in this region." "…the Belt and Road Initiative provides a timely platform for the delivery of green finance to help meet the estimated $22.6 trillion infrastructure funding gap required until 2030 in Asia and the Pacific." Below are some significant listings. London is in an unrivalled postion to support the financing of the Belt and Road Initiative(4). 3 Source: LSE, Factset, Dealogic, October 2017. BRI countries using PROC Government definition: Azerbaijan, Bahrain, Bangladesh, (Greater) China, Czech Republic, Egypt, Georgia, Hungary, India, Indonesia, Iraq, Israel, Jordan, Kazakhstan, Kuwait, Kyrgyzstan, Lebanon, Malaysia, Mongolia, Myanmar, Oman, Pakistan, Philippines, Poland, Qatar, Romania, Russia, Singapore, Slovakia, Tajikistan, Thailand, Turkey, Ukraine, United Arab Emirates, Vietnam. Data include money raised through IPOs and Further Offers in last 10 years.